Rob Jones, a U.S. Marines veteran and double amputee who completed his goal of running 31 marathons in 31 cities in 31 days in 2017, will be the featured speaker for the Health & Fitness Expo, part of the Covenant Health Knoxville Marathon weekend March 30-31. Jones will share his inspirational stories at the Health & Fitness Expo at the World’s Fair Exhibition Hall at 3 p.m. on Saturday, March 30. The expo, which takes place from 9 a.m.-8 p.m., is a high-energy event featuring fitness, sports, wellness and nutrition exhibitors. The event is free to attend, and open to the public and race participants. Jones’ appearance is sponsored by Prestige Cleaners, Prestige Tuxedo and Eddie Mannis for Mayor. In 2008, Jones served in Habbaniyah, Iraq, with the U.S. Marines Corps. In 2010, he deployed to the cities of Delaram and Sangin in Afghanistan. While attempting to clear an area believed to contain an improvised explosive device (IED), Jones was wounded in action by a landmine. The traumatic injury resulted in the amputation of both of his legs above the knee. Jones underwent intensive rehabilitation at Walter Reed Army Medical Center and was fitted with prosthetics. He then began rowing, biking and running. He earned a bronze medal in rowing in the Paralympics in 2012 with his rowing partner, Oksana Masters; completed a 5,180-mile bike ride across the United States from Bar Harbor, Maine, to Camp Pendleton, California, in 2014 to raise $126,000 for wounded veterans; and finished his goal of running 31 marathons in 31 cities in 31 days in 2017, raising more than $200,000 for organizations that assist veterans and honor first responders. The Covenant Health Knoxville Marathon weekend takes place at World’s Fair Park and will include a post-race festival. In addition to the full marathon, the event also features a half-marathon, two- and four-person relays, 5K and Covenant Kids Run. The Health & Fitness Expo on Saturday, March 30, also is the location for mandatory packet pickup for all race participants. Each participant must bring a photo ID in order to receive bib, timing chip, T-shirt, goody bag and other instructions. There is no Sunday packet pickup. The Covenant Health Knoxville Marathon recently was named best marathon in Tennessee by “Runner’s Goal.” For more information and to register for the 2019 Covenant Health Knoxville Marathon races, visit www.knoxvillemarathon.com. 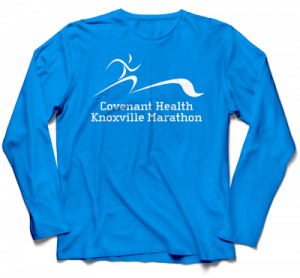 The Covenant Health Knoxville Marathon is a premier event organized by the Knoxville Track Club, a nonprofit 501(c)(3) organization dedicated to the encouragement of physical well-being through running and walking.